Yesterday, after a long and grueling day at work, I spent my afternoon and evening reading the first Circle of Magic book, Sandry’s Book (Young Adult 252 pages) by Tamora Pierce. If you’ve read any of my other reviews, you should know by this time that I am tired of “standard” stories with the same characters and the same plot lines and the same predictable love triangles and all the other things which create the typical young adult tropes. Thankfully, this book had absolutely zero of the things which annoy me so much 🙂 And if you’re curious about some of the things that do annoy me, you can read some of them in my review of City of Bones from last week. Top of the list is that there were absolutely ZERO romantic subplots or engagements. There is so much to like and appreciate about this book that I’m not quite sure where to start, so I’ll start with the most obvious, which is the characters. Most of this book focuses around four very young protagonists, each of whom are completely different with only one main commonality, which is that none of them fit in with their peers, nor with their environments. All four of the characters are in situations where they are unwelcome or unsuited to the worlds in which they live. All four of the characters are also remarkably diverse. “Trapped in a dark cellar, a noble girl waits hopelessly, for the door of her prison is sealed with magic.” This is the introduction of the first, and title, character in the book, Lady Sandrilene fa Toren, a young girl who is magically hidden in a room while smallpox and riots destroy her home, her family, and everything she knows. Within the first several pages, Sandry is already a relatable character because she indicates that noble-born girls are only good for being waited on and getting married. This echoes most of my thoughts about how our modern society wants to raise their girls as princesses and focus mainly on their appearance, their polite and non-confrontational attitudes, and basically making shallow women who are expected to pay attention to frivolous things instead of allowing us to be women of substance. 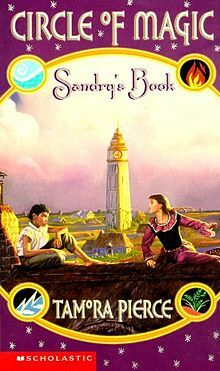 This makes Sandry an even more likeable character for me because as the book progresses, we see the Sandry isn’t frivolous at all. She’s a loyal and dedicated friend; she’s smart and compassionate; she never mentions her rank or position unless it’s required in which to help other people; she has no issues jumping into brawls in alleys filled with trash to protect those who are being bullied; she is kind and generous; and she is something of a peacemaker between the other three junior residents of Discipline. She is the character I would aspire to be most like in this book because I admire all of the actions she takes and how she works to include and make friends with the other three characters. She sees that Tris is having a difficult time and she gives her a tapestry for her wall and she stands up for Daja without knowing anything about her. She gives freely of herself and accepts those around her for who they are. Sandry also had the absolute most interesting paragraph on page 37: “Sandry toyed with her fork, bored almost to tears. She wished that the servers would serve. If they did, the other well-born maidens at her table would refuse to chatter with full mouths, and her aching ears would get a rest. It wasn’t as if they ever said much that was interest; all they spoke of were fashions and marriages. By now, after nearly eight weeks of their companionship, Sandry was sure that she was interested in neither.” This struck me particularly close at the current time because in the last week, I’ve had extended and lengthy discussions with many of those with whom I am close because I have someone I go climbing with regularly who I struggle to communicate with. I have asked her several times what kind of conversations would be normal and she said talking about boys, make-up, clothes, periods, hair products, and things of that nature. None of that is appealing to me and most of my conversations involve dragons, aliens, books, the world, space, character traits and character development, heroes, villains, comic books, and other things of that nature. I’ve been told that I ask people questions that they’ve never been asked before and never thought of before, like asking what you admire most about each of your family members, what you think life would be like if you chose to be on an initial colonization mission to Mars or other planets in general, and how your life might have been different if that one key, life-changing event had gone differently. Appearances and finances do not make people who they are and I have no interest in things that seem so shallow and frivolous to me. So I relate to Sandry in just about every way. “The lone survivor of a shipwreck, a young Trader is pronounced an outcast by her own people.” The introduction to Daja Kisubo says right from the beginning that she is not a white character. She’s from a family of Traders who spent their lives on the open sea, which makes sense that she would not have a white complexion because of extended time out at sea and in the elements. When Sandry first sees her, she describes her physically on page 38 as “big for a young girl, broad-shouldered and thick-waisted” which also says that she is not even remotely the typical young adult heroine or protagonist. The biggest draw for me to Daja is her passion for the forge. Even though she spends most of the book not knowing about her true calling, she can still feel it in her bones. She has a sense of wonder and passion that can’t be duplicated, nor replicated. She has faith and trusts herself as well as those around her. Even though she is an outcast from her people because it’s considered bad luck to be the sole survivor, she still has faith in them and doesn’t harbor ill-will towards them for casting her out. She misses them and misses the lifestyle, but she understands why her people did what they did by banishing her and sending her away. She doesn’t change her behavior, nor does she change who she is, because of the situations in which she finds herself. She laughs freely and she spends time working on things that she believes in, even though her people would never understand. I think the parts where she is dealing with fire and in the forge are my favorite parts of the entire book just because of how much passion Daja shows for the forge. She is strong and doesn’t back down from a fight; she stands up for her friends; and she is also remarkably graceful with her actions towards others. Daja’s sections in the book are the ones that created the strongest emotional pull for me and she is a fantastic character. “Third time unlucky: a thief who has again been caught stealing will be sentenced to a short, brutal life of hard labor.” This is the introduction to the character who starts in this book named Roach and then becomes Briar Moss. Briar is a fun character because you know that he says he’s going to spend just one more day in the new lifestyle and then he’ll wind up staying there indefinitely. For all that he came from a group of thieves, he doesn’t start the novel as a very solid team-player and he constantly indicates that he thinks he should escape from wherever he is and whatever situation he’s in. He has a fantastic sense of what’s truly right and wrong and the vast majority of the things he steals are plants, which is probably the oddest thing someone could steal. He clearly loves plants right from the beginning, even when he’s in a jail cell and excited about the bed of moss and admits to giving the moss some of his own rations. His interactions with plants was extremely motivational because of his deep emotional bond with those plants and the strength of his attachments. He is drawn to the plants and he treats them with the respect and caring the people in his life have neglected to share with him. “A girl whose strange connection to the weather unsettles everyone, including herself, has run out of refuges.” Trisana Chandler starts out this book in a temple dormitory where she overhears other girls say the most unpleasant things about her, talking about how no one wants her, her dresses are ugly, she’s fat, and she has no value. Tris sees herself as worthless and as though she is a burden to all those around her. She’s from a merchant family and knows the exact value of everything around her, which makes her see the world around her only through the lens of how much something costs. She has the most interesting character and story-arch out of all four of the main characters because she changes greatly in her view of people as the story progresses. Not to say that the other characters don’t, but Tris has both less and more reason than any of the other characters to seek out positive interaction. She’s been discarded by so many people for so long in her life that she doesn’t see the benefit in pretending to interact in any sort of positive way with the people around her. She’s a very relatable character from a lot of the things my own brain has told me in the past, even though that’s not where my life is right now. And yet, as she gets to know the other junior residents of Discipline, she sees them stand up for her when they don’t have to; she sees them helping her, being patient with her, and becoming the family she wasn’t born to but who cares about her. She helps to teach the others how to properly clean things and she completes her assigned tasks, even though she feels as though it’s just a matter of time before she gets kicked out of this sanctuary. She even faces her fear and stands up for the other junior residents of Discipline. She seems mean and stand-offish, but she protected her friends when they needed her. In this book, Tris just doesn’t know how to deal with people who care about her whom she also cares about. Her first instincts are always to take care of those in Discipline, even though she refuses to acknowledge it. While there didn’t seem to be much sign of a large, over-arching concern that needed to be addressed, this was a good opening book into the series. The character introductions were all solid and the story was good. This is a very character-driven book and I enjoyed it greatly. Overall, I rate this book easily as a high three on my rating scale. I am glad I read it, I am definitely going to read the next books in the series, and I am likely to actually buy all of the books when I’m done, depending on how the rest of the series goes. Pierce, Tamora. Circle of Magic: Sandry’s Book. Scholastic Press: New York, 1997. This entry was posted in Book Reviews and tagged Book Review, Circle of Magic, Circle of Magic: Sandry's Book, Sandry's Book, Tamora Pierce. Bookmark the permalink.